Do you know of an insulation project that would make a good article for Insulation Outlook? We've created a Project Questionnaire with a simple series of questions about project details. Once completed, Insulation Outlook staff can use this form to create an article featuring your project. Send completed forms to editor@insulation.org. Insulation Outlook, the official magazine of the National Insulation Association, provides substantive articles on issues of interest to engineers and the mechanical insulation industry. Send your articles and press releases to editor@insulation.org. Relevant press release are printed free of charge to enhance to readers knowledge of the insulation industry. Write for Insulation Outlook magazine and share your expertise with the world! Insulation Outlook is the only publication that is dedicated to increasing knowledge about insulation and mechanical systems around the world. If you work with insulation every day, you might be able to help us in our mission. 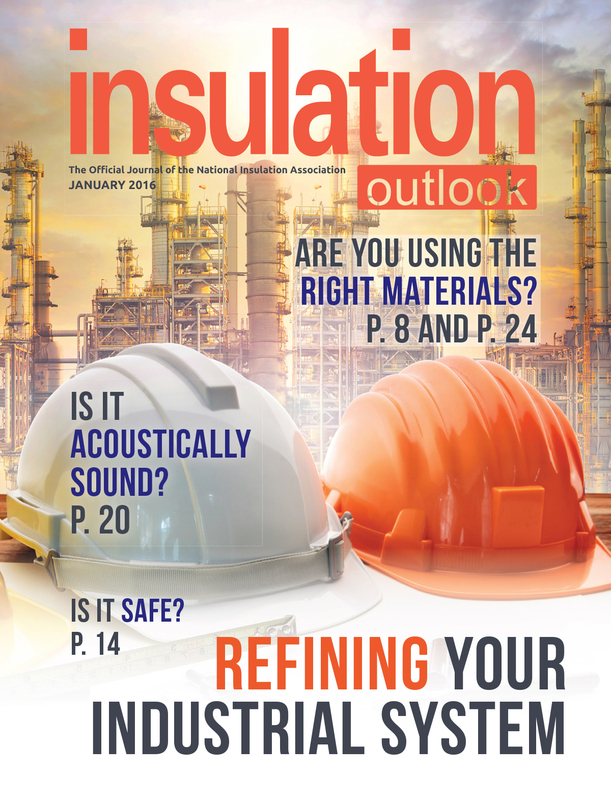 Share your knowledge of proper installation techniques, specification and design best practices, and insulation material physical properties and applications by writing an article for Insulation Outlook magazine. While we ask that articles remain unbiased and that products are only discussed in generic terms, rather than by brand name, insulation companies do get recognition through the byline and author biography. Author’s name, title, years of experience, and area of expertise. Author’s company, and a brief description of their products and services so that the audience understands their expertise. The author’s email address and the company’s website are also included. This change will help our readers appreciate the author’s depth of knowledge and will also help promote the author and the company’s products. Readers also frequently reach out to authors to learn more or inquire about products and this facilitates that communication. Topics are subject to change based on reader feedback and submissions received. If there is a topic you would like to cover but don't see listed, please let us know. We prefer a brief article statement or abstract to help determine possible article placement. Send any questions or comments to Julie McLaughlin at publisher@insulation.org. Check out the 2018 Editorial Calendar for more details. Before you submit an article for consideration, please read the Insulation Outlook writer's guidelines below (you can also download them as a PDF). Insulation Outlook is not written for NIA members. It is written by NIA members for the insulation end user. NIA News is the NIA member publication. Our audience is made up of more than 11,500 subscribers in the industrial and commercial insulation industries. More than 80% of them are insulation end users: mechanical engineers, plant managers and owners, insulation contractors, architects, specifiers, and facility and maintenance engineers. They are likely familiar with insulation concepts but want more hands-on information; some readers may be experts on your topic. We strongly recommend that writers review the circulation data in the media kit for a better understanding of our audience. NIA has a multi-tiered review process, which can include member(s) of the NIA Board of Directors and Technical Information Committee, staff, and independent technical experts. Reviewers will contest what they consider misleading or incorrect information. Be sure to thoroughly research your topic and provide documentation within the article for any claims or assertions, especially those that may differ from commonly accepted principles within the mechanical insulation industry. Articles are reviewed for technical and factual accuracy, marketing language, commercial bias, safety issues, and liabilities. Articles with a marketing bias will be rewritten or rejected. Use generic terms and don’t promote one product or brand and/or denigrate another. Avoid sales pitches; those are allowed only in advertisements that are paid for and clearly labeled as ads. If you would like to review the final, edited article, please note this when you submit the article. For features, the preferred range is 2,000 to 3,000 words. Shorter pieces are about 1,500 words. Sidebars, charts, and photos are counted separately from the primary article. Begin with a general overview of the subject (two to three paragraphs) and lead into a step-by-step review of the issue. Include a suggested headline and subheadings to highlight significant sections. Present details as bulleted lists. Use resource lists and sidebars for more information, models, and samples. Write in the active voice, putting your subjects before your objects. (Instead of writing "The plan was approved by our department," write "Our department approved the plan.") Avoid wordy phrases. (Instead of writing "The uses of insulation are many," write "Insulation has many uses.") Active voice reduces excess words and gives writing momentum. Interviewing others is encouraged. For example, in an article about corrosion or firestopping, you may want to talk to plant managers or facility engineers to find out how they handled those situations. Spell out acronyms (ASTM, ASHRAE, etc.) on first reference. If you have quoted or paraphrased information from other sources, include footnotes or a list of references, including the publication title, author, publisher, and publication date. Material from other sources must be clearly identified to protect the original author’s copyright. By allowing your article to be published in Insulation Outlook, you agree to accept legal responsibility for any copyright violations you commit in your article text. Be evocative and descriptive. Consider "When I walked outside, it was humid and the air was thick." and "When I walked outside, I started breathing soup." The first example states a fact; the second paints a picture. Illustrations, such as charts, tables, graphs, or photos, are encouraged. If an illustration must run close to a particular part of the text, indicate this location in the Word document. Please send a caption with each graphic. Images should be sent as separate tiff or jpeg files, not save as images in the Word document as this reduces the image quality below professional print resolution. Photos should be clear, in focus, and have good contrast. If needed, credit/source information should also accompany the file. Authors are responsible for obtaining permission to use any graphics to which they do not hold the copyright. This includes graphics found on the Internet. (Graphics owned by the federal government are not copyrighted; anything else probably is, whether it is marked as such or not.) By allowing your article to be published in Insulation Outlook, you agree to accept legal responsibility for any copyright violations of illustrations you submit. Photo releases are also the author's responsible to obtain and provide to NIA. Photo releases are required when a person is pictured clearly and can be recognized. Articles should be in Microsoft Word or a universal format such as RTF (rich text format). With the exception of Word tables, provide each graphic as a separate file. TIFF files are preferred (JPEG files are also accepted); a minimum resolution of 300 ppi is required. As noted above, inserting graphics into your Word document, while useful for showing placement, does not provide sufficient quality for a printing press. Also, manually increasing the resolution in a photo editing program without reducing the physical dimensions proportionally will not result in a quality image on press. Insulation Outlook uses a house style based on the Chicago Manual of Style. We make editing changes such as such as correcting grammar, eliminating bias, or rewording some sentences. Sometimes we need to rearrange paragraphs or delete sections that don’t apply to our readers. We occasionally may edit for length or tone, even if your article was within our guidelines. Substantial editing is sometimes required and staff is happy to help non-professional writers or industry experts. Technical editing is done by members of NIA’s Technical Information Committee. They may make comments, suggest changes, or ask for verification on technical items to prove technical accuracy of statements or claims. At your request, we’ll email you a copy of the edited version prior to printing. Insulation Outlook accepts, but assumes no responsibility for, unsolicited manuscripts; authors of unsolicited manuscripts are required to sign an Author Agreement if the article is accepted. Email word and separate image files to editor@insulation.org. Please do not save images in your word document. If your files are too large to e-mail, you can try a Dropbox or Hightail link. If you have questions, contact editor@insulation.org or call 703-464-6422, ext. 118.